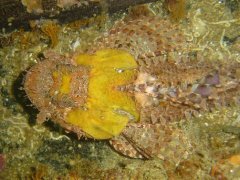 The first sighting of this fish in 2004 caused much excitement, and it even made it into a newspaper. Finding what seemed to be such a classically tropical species in cold water was definitely news-worthy. 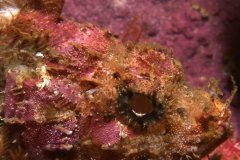 Using "Two Oceans" as a source it was quickly assumed to be a raggy scorpionfish, Scorpaenopsis venosa. 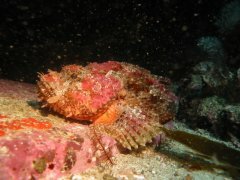 As Guido Zsilavecz was busy researching his book on Cape Peninsula coastal fishes, he collected as many photos and information as possible from those divers who had seen it, and was not satisfied with the identification (there is no other similar scorpionfish shown in "Two Oceans", hence the belief it was this species by those who had seen it), and investigated. 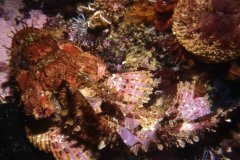 Using information about size estimates he decided that it was more likely to be the tassled scorpionfish, Scorpaenopsis oxycephala, as it grows to a larger size, corresponding better to the reports from divers. Furthermore, it is more common in South African waters. 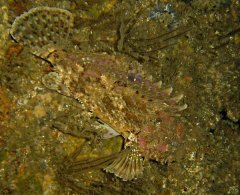 A request from SURG went out to divers to please photograph and report sightings of this fish, and since then it has been established that it occurs from at least Long Beach all the way to Batsata Rock, on the south side of Smitswinkel Bay, and on virtually all off-shore reefs. The Long Beach sighting was the shallowest and most inshore sighting, and quite unusual. 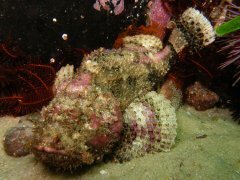 In 2008 Georgina Jones happened to be talking to Dave Japp who reported that this fish has been trawled a few times off Cape Point in relatively shallow water, and that it was identified as Scorpaena scrofa. Guido Zsilavecz looked at images obtained from research trawls and found a record of the same fish, albeit mis-identified, taken in nearly 100 m depths south of Cape Town. Further research on Fish Base and reference guides showed clear similarities between the various fish. Smiths' Sea Fishes states that the fish is known from northern Europe (also a cold-water environment), as well as Algoa Bay and Natal, from depths of 55 to 90 m. It is thus most likely that the fish seen in False Bay are indeed S. scrofa, just in depths less than initially known. It is possible that this species may also occur on the west coast of the Cape Peninsula, but it has thusfar not been sighted. Smiths' Sea Fishes, MM Smith and PC Heemstra, 1986. Coastal fishes of the Cape Peninsula and False Bay, a divers' identification guide, G Zsilavecz, 2005.